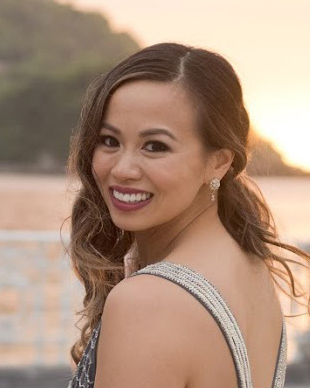 Alright everyone, it's time for me to tell you about a little secret I learned from other foodies who lived in New York before I moved here. 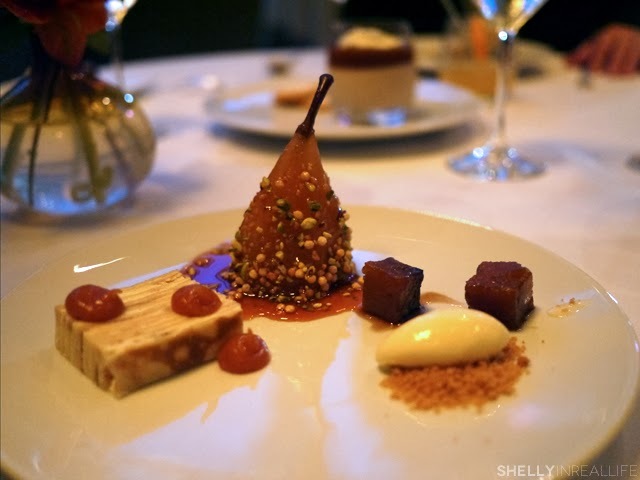 You must go to Jean-Georges for lunch and treat yourself to the world of fine-dining in Manhattan without seriously breaking the bank. 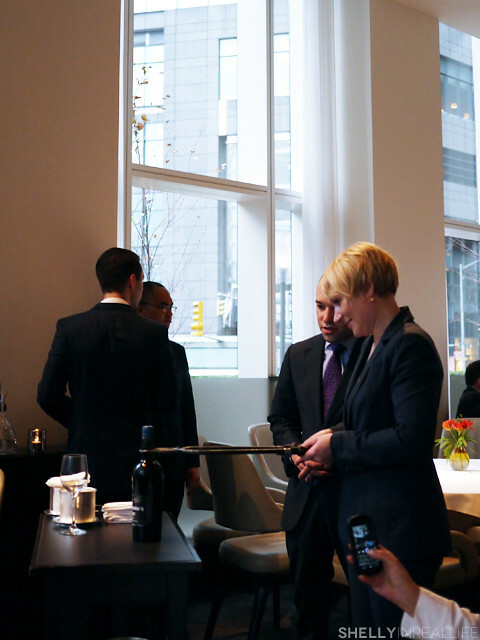 It only took me 3 years to take this advice, but I finally made my way to Jean-Georges for lunch a few days ago. We were able to grab a table pretty easily on OpenTable a few weeks prior and managed to get a table for 4 people at 2:30pm on a Monday which was a perfect time for us. 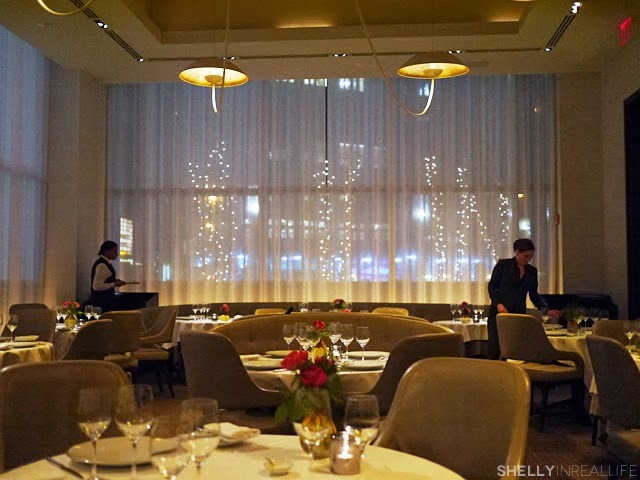 Once we got through the festive atmosphere of Columbus Circle during the holidays and into the Trump International Towers, we were seated in the bright and modern dining room at Jean-Georges. 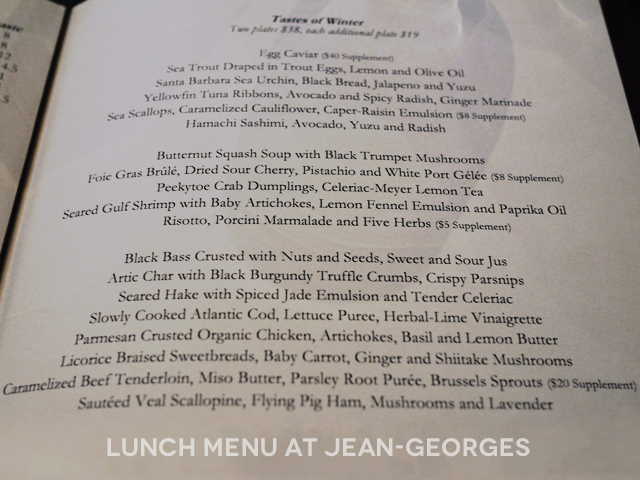 During lunch, JG currently offers "Tastes of Winter" with your choice of 2 dishes for $38, and each additional plate for $19 extra. 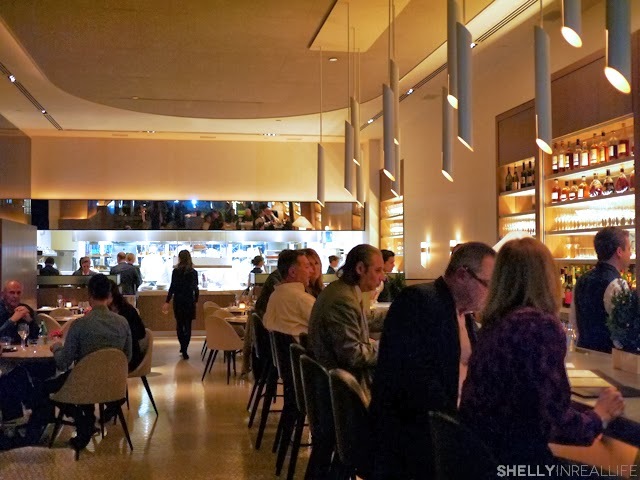 This means if you only ordered only 2 dishes and nothing else, you can potentially walk out of Jean-Georges spending less than $60. 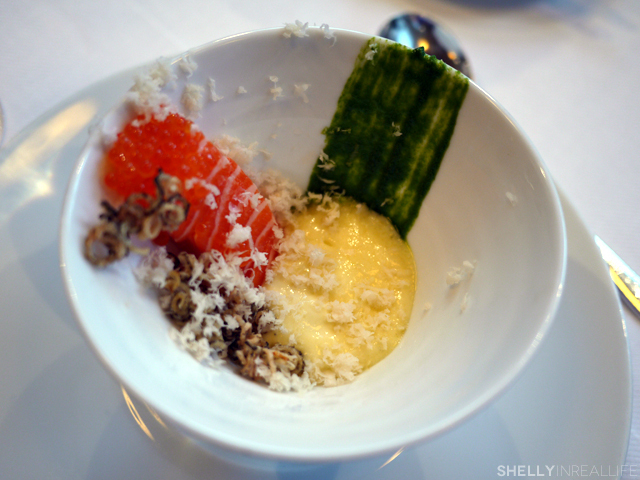 A 3-Michelin Star Restaurant experience for less than $60? That's pretty much unheard of and seriously a great steal. Despite being at Jean-Georges on a smaller budget, we still felt like the meal was a 3-star experience. 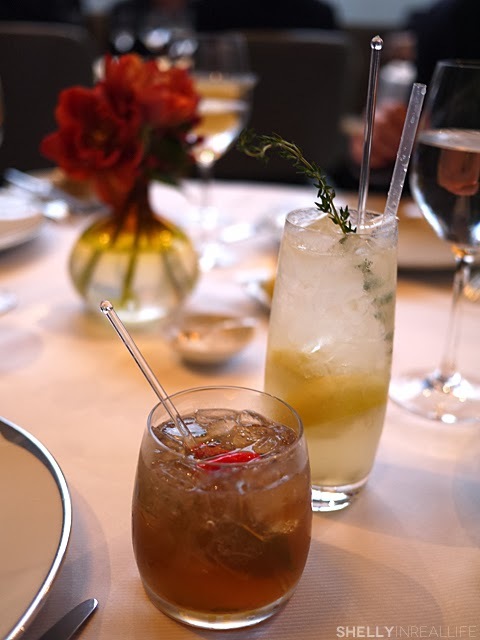 The first for me was the cocktail that I chose, the Thai Phoon, made with Smith and Cross Rum, ginger, kaffir lime and Thai chili, it was hands down one of the most unique and memorable cocktails I've had in 2013. At first sip, the kaffir lime really shined through and it tasted like I eating a Thai food dish, which I simply loved. The other cocktails that everyone else ordered were definitely on par and all similar delicious (but mine was still the best, duh). We also witnessed a bottle of port being opened by port tongs. I've never seen this before and by the looks on everyone else's faces around us, very few people have. As it turns out, the older the port, the more difficult it is to pull the cork out. Instead of trying to uncork the bottle, you can get into the bottle by cutting the wine bottle. According to the menu the vintage port is $128 a glass so I probably wouldn't be ordering a bottle anytime soon but it was super fun to see this happen right in front of us. 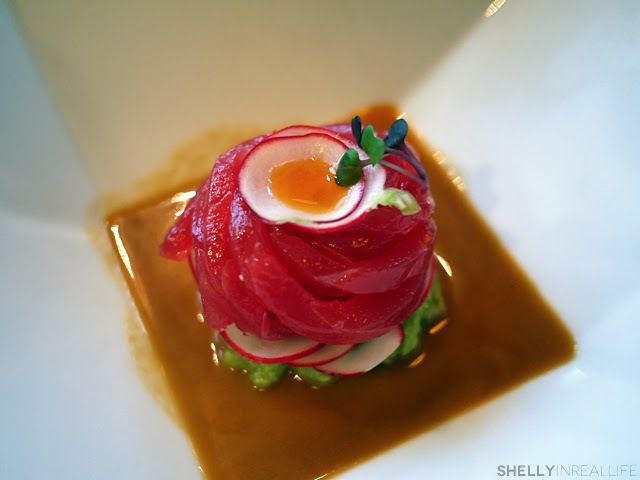 The Tuna Ribbons were fun to eat and I realized I've actually seen this kind of preparation for it at Boulevard in SF. Also, I definitely had order-envy/regret eyeing my friend's Sea Trout dish which looked simply beautiful and unique to eat - much more interesting than my dumplings. 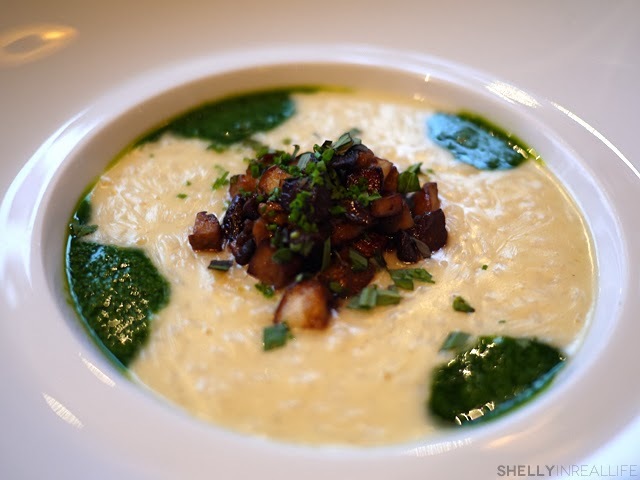 Of the 5 dishes here, this Risotto (above) really shined, the rice was covered in a really creamy sauce that was rich but wasn't overwhelming. 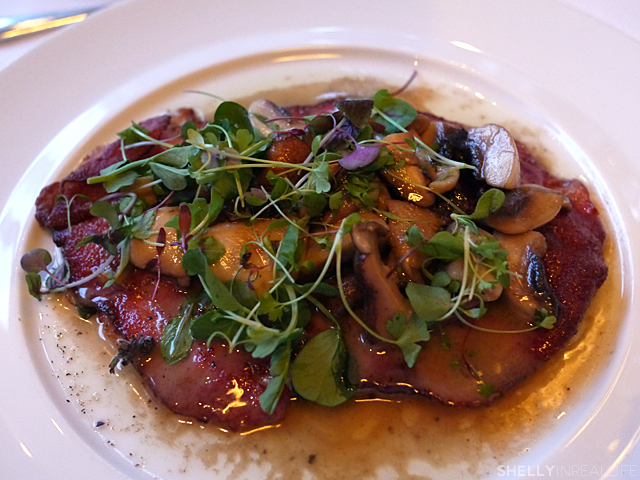 If you love mushrooms, then this pile in the middle will be a perfect accompaniment. Our friend mentioned that the dish kind of reminded him of sour cream and onion chips, in a good way and I have to agree. This was so addictive and I would easily order it again. 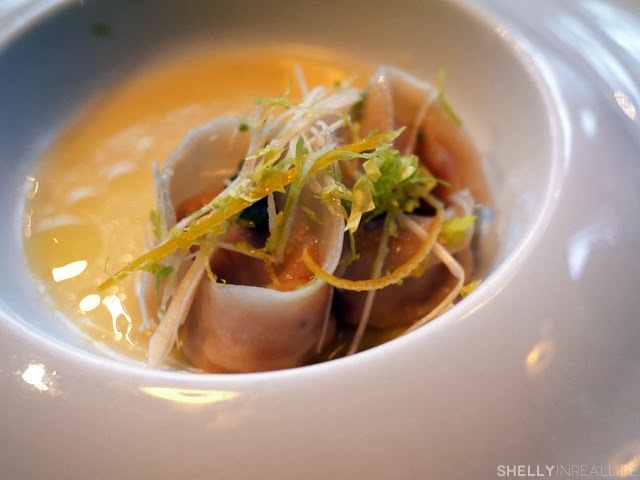 I picked the Peekytoe Crab Dumplings (below) which I now realize I probably shouldn't have. While the dumplings were perfectly wrapped and I enjoyed the lemon zest and the lemon tea sauce that balanced the flavors of the dish, I should have realized that dumplings just don't impress me as much since I'm so used to having cheap delicious dumplings in Chinatown or just make some at home. If you have such relationships with dumplings, I recommend skipping this dish and ordering something more special to you. 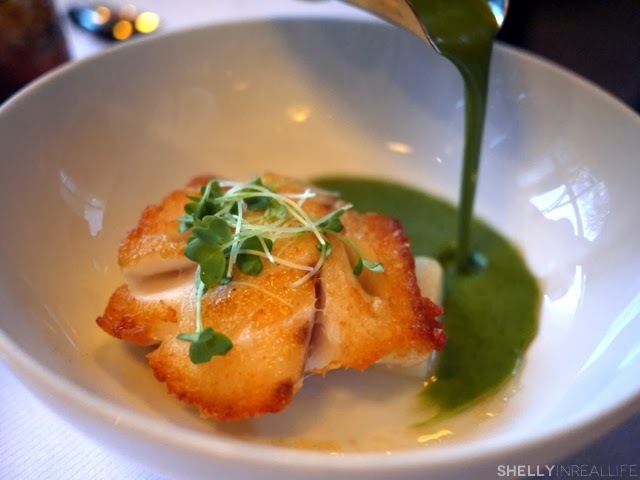 My order-envy was soon erased by the taste of the foie dish. 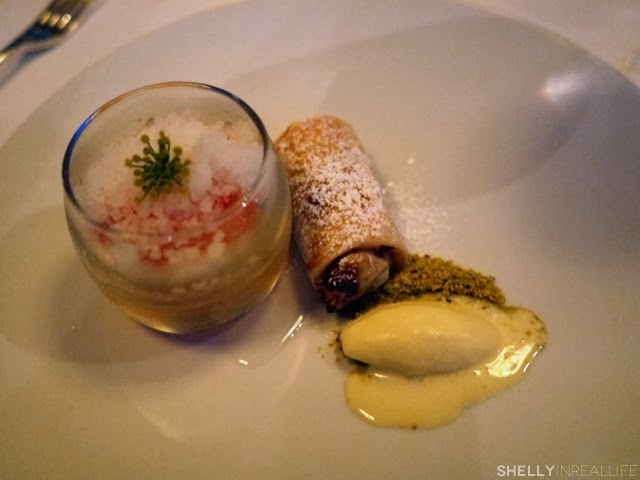 I'm a sucker for foie, so I enjoyed the Foie Gras Brule very much. 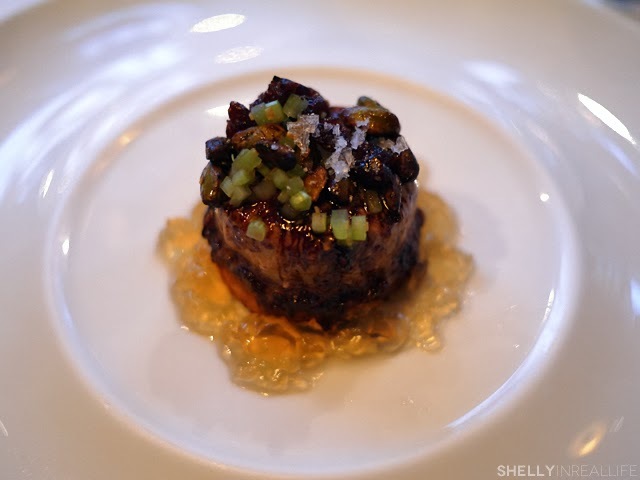 The crunchy texture of the pistachio along with the smooth foie and the toast underneath made a perfect little bite. 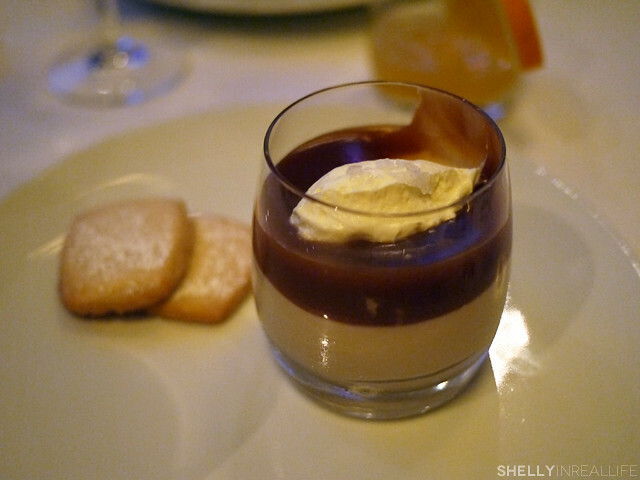 Just as the bite became a bit too rich, the white port gelee really helped cut through some of the fattiness. I'm not sure if I could have eaten the dish by myself, but I really enjoyed my bite. 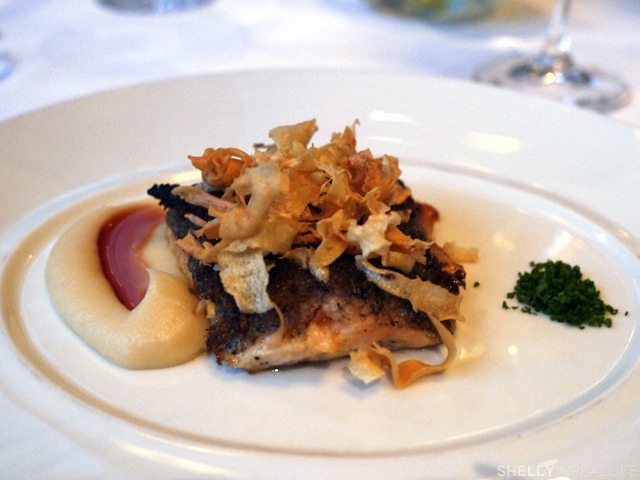 All the fish dishes here were fabulous, so it really depends on your personal preference. J loved his Artic Char, it was perfectly cooked with just a touch of pink. The sauciers should win an award for how well each of the sauces pairs with the dishes here. 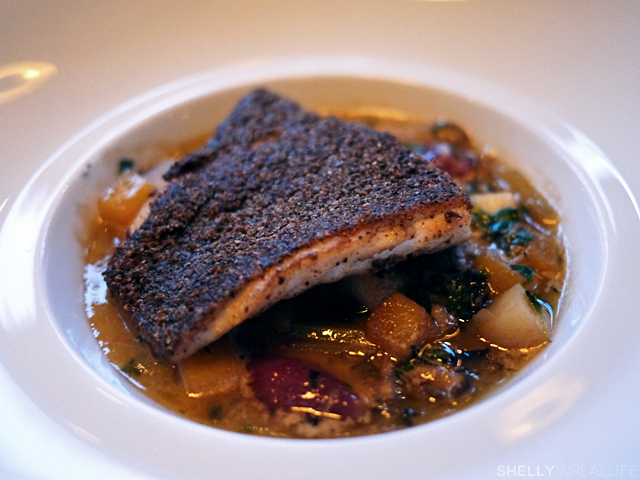 My Black Bass was perfect for me as it had a perfectly crispy skin on the fish sitting on top of a savory and tart stew of pearl onions, tomatoes and butternut squash. I wanted to slurp the whole thing up. The hake as you can see, is perfectly seared but not overcooked, paired with an asian-inspired sauce made from a mix of spices, reminiscent of a Thai curry. The only dish that I didn't love here was the Veal Scallopine (above), which was a surprisingly huge portion, however the combo of veal, ham and sauce was just way too salty for my taste. The mushrooms on top were lovely and helped cut through some of the meatiness, but still, just couldn't get past the saltiness. All the desserts were great, but I particularly loved the festive look of the poached pear with candied nuts from the December tasting. Looks like a happy Christmas tree!! The warm chocolate cake from the Chocolate tasting was also good, but probably not the most innovative dessert. Since we didn't order the caramel, our waitress was nice and gave us a bonus dessert, some type of pudding/cream topped with some amazing caramel sauce and shortbread cookies on the side. LOVED IT. NOM. Didn't see it on the menu though but I would easily order it again if it was on the menu. The lunch finished about 2.5 hours later with our petite fours and fresh marshmallows which is just a delight. The marshmallows are so fluffy and cloud like and just what you hope your marshmallows would be and more. 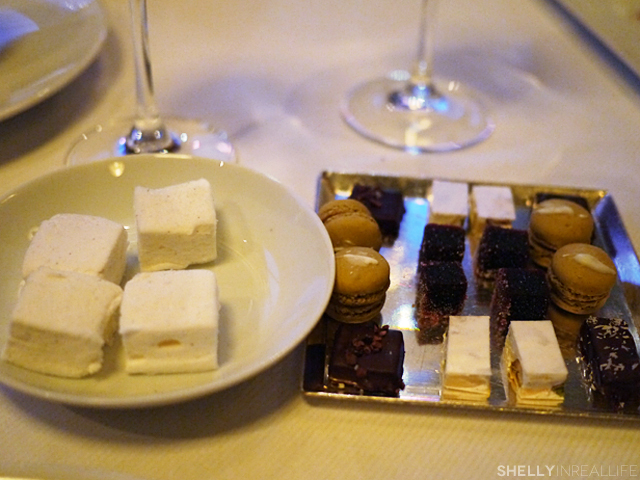 The other petite fours were pretty standard, nothing particularly stood out but I did enjoy the macaron, as always. By the time our meal was finished, most of the dining room had cleared out and dinner service was being set up. I don't think we were eating particularly slow, rather we were served our courses a bit slower than expected. Since we had nowhere to go and not particularly starving, it was a good pace for us but I would think that others might not feel the same way. To get to Jean Georges, you have to first walk through Nougatine which is the more casual experience right next door! 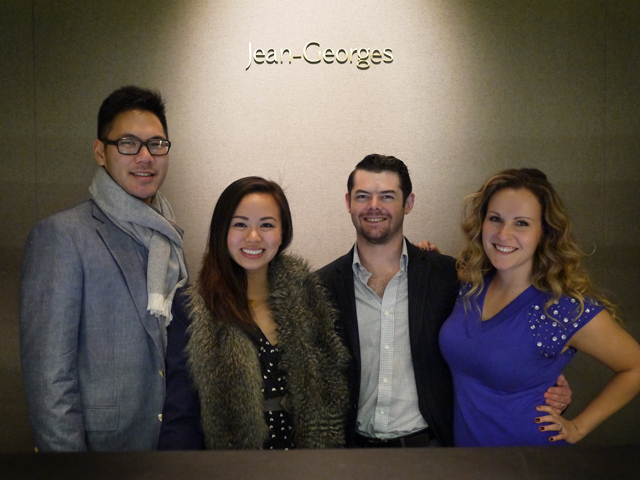 Overall, lunch at Jean-Georges was a very enjoyable experience for us. We did notice that the service was a bit less formal than we expected, but since it was lunch service, things might have been a bit different. J did notice that the waitress who came in for the dinner shift was much more stiff and proper compared to our waitress. I usually prefer things to be a bit more casual so I definitely didn't mind. There were a few other nit-picky things that I could think of that made the experience not as "3-star" as this place is rated such as the fact that the bread passed around was actually rather cold and bland as opposed to having it served to us piping hot out of the oven. The restroom was actually outside of the restaurant and shared with the hotel which made things a bit weird since there's so much foot traffic through there and the cleanliness isn't quite there. But once again, at this point I'm just pointing out a few observations that didn't really impact my experience dramatically. The price that we paid for lunch is honestly better than anything you could get at a Restaurant Week deal, for only a few dollars more, the quality and service here is just outstanding. J and I with the Webbs! 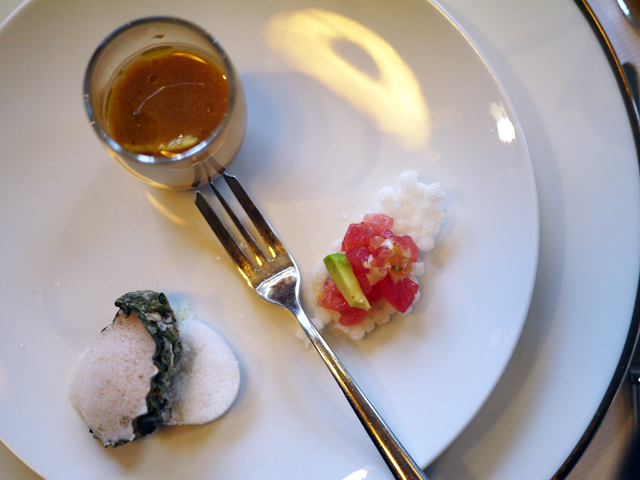 That said, I'm not sure if I would go out of my way to come back to try a full tasting menu for lunch or dinner. 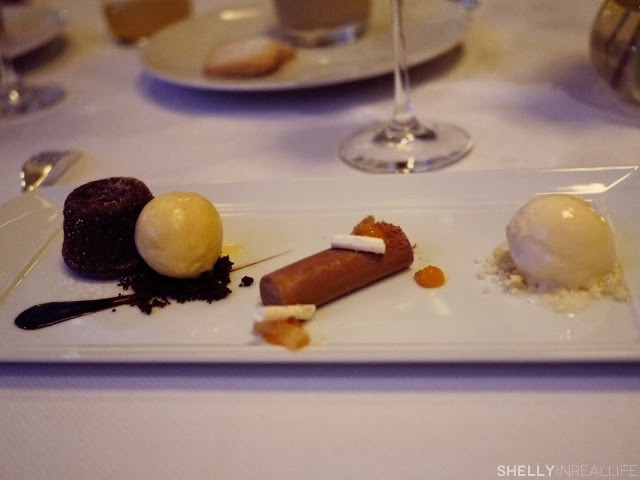 However, I would easily recommend Jean Georges for anyone who is looking to ease their way into fine dining or just wanted a great lunch in the city. So wait are you waiting for? Don't be like me and wait 3 years before you have lunch here! P.S. Our friend is gluten-intolerant and our waitress was so nice and accommodating to her gluten-free needs, so A+ on that front!